The item arrived soon, thank you. Thank you for having the opportunity again. This review is about item#5518737. 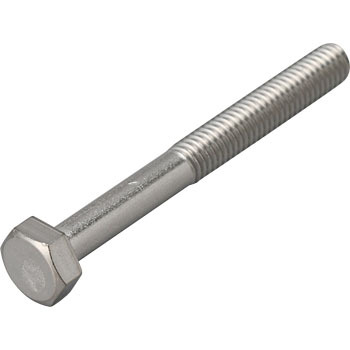 I feel cheap without a stamp on the head of the bolt whether it is different from the model number I ordered last time. Please specify the official stainless steel name. Just because it is "stainless steel", I want to think about the next order. This review is about item#05518597. This review is about item#05518606. I am satisfied with the goods I expected. This review is about item#05518581. I was able to purchase the size as desired and the length of the screw part. MIC KONOE Made in Japan Can be used with high quality with confidence. It seems that durability can also be expected. I am happy with the price. This review is about item#05518432. When used with Tomoe's nylon nut, it was impossible to loosen it as it got caught in the process of closing. I tried the second one but got stuck in the same way. Perhaps it is soft and not rigid or incompatible with lock nuts. Because one of the nearby home centers bolts of 45 yen can be used, I think that this bolt that exceeds one hundred yen will not be used in the future. This review is about item#05518685. To stainless steel tea machine parts. Both quality and price, both good and bad. This review is about item#05518703. This review is about item#05518843. It is used for fastening motorcycle parts. Grind the head, adjust the length and use. This review is about item#05518834.